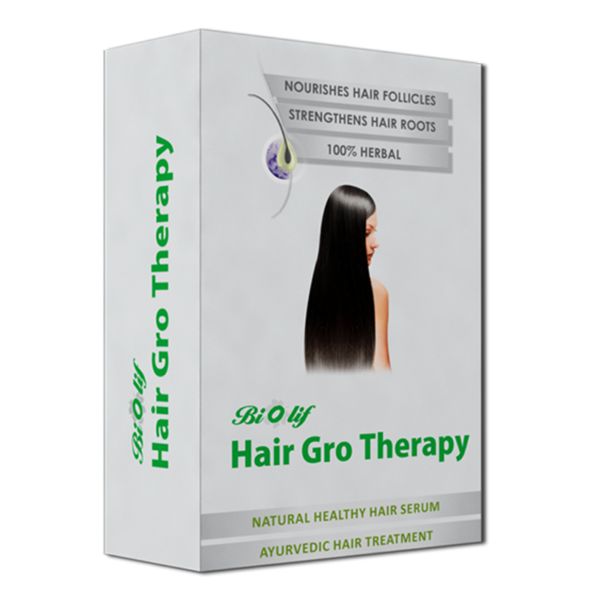 Hair Gro Therapy is hair treatment for natural and thick hair. Prevents hair loss and ensures regrowth. Biolif Hair Gro Therapy is a revolutionary complete hair care solution for any kind of hair problem. 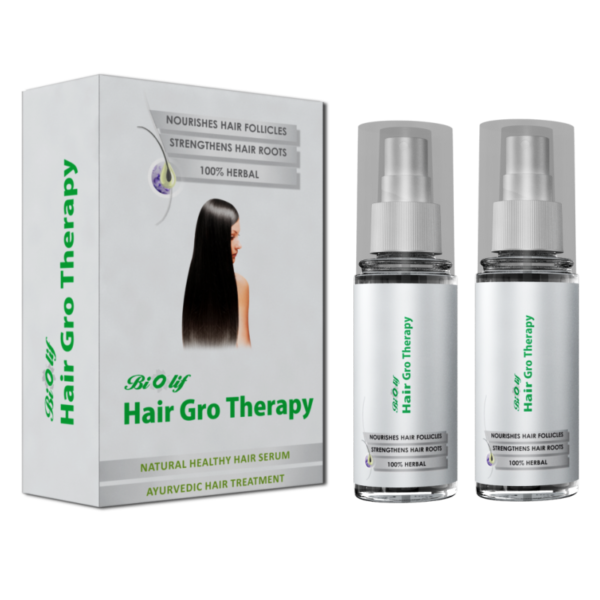 Hair Gro Therapy is a serum designed to make hair follicles and root stronger to avoid hair loss. The unique mixture of pure and healthy herbal oils such as Lavender Oil, Pumpkin Oil, Rosemary Oil, Olive Oil, Almond Oil, Dudhi Seed Oil, Asparagus Oil etc. 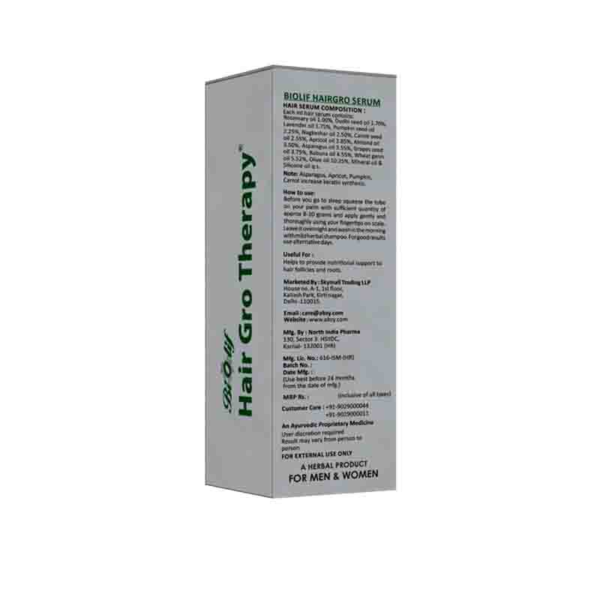 ensure that Hair Gro Therapy reduces hair loss, balding and graying of hair. The ingredients are chosen and mixed in such a way that they enrich the hair with all the required nutrients and are able to make healthier, stronger and thicker. Hair Gro Therapy serum works inside out. It’s completely chemical free and ensures not just existing hair becomes stronger but the volume of the hair also grows simultaneously. 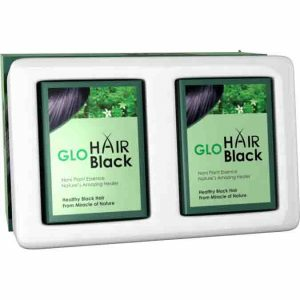 Innovative composition from the lap of Ayurveda enables Hair Gro Therapy to provide complete care for the hair and scalp. It nourishes the hair and makes them stronger from inside and shiny from outside. It’s completely free of any side-effects. 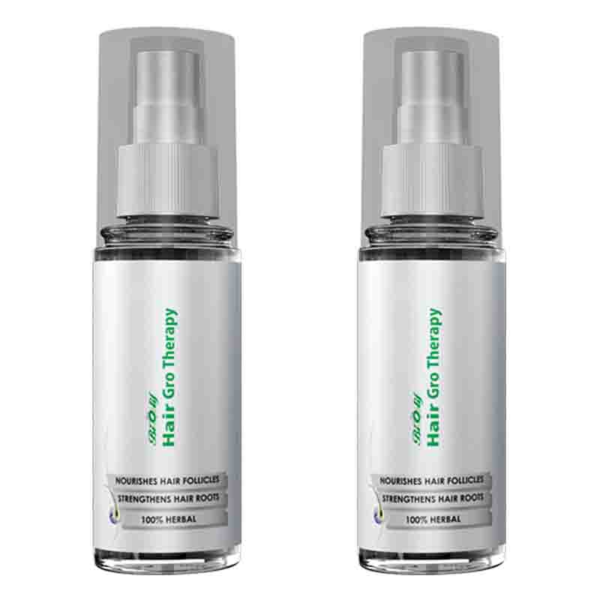 Why is BioLif Hair Gro Therapy special? 100% Ayurvedic and free of any side-effects. Stops hair fall, and triggers regrowth of new hair. Nourishes and strengthens the hair. Treats dandruff and softens the hair. Moisturizes and repairs the hair. Applicable to all types of hair. Who can use BioLif Hair Gro Therapy? Men and Women who care for their hair and want natural & thicker hair to add value to their personality. Note: Can be used on all types of hair. How to use BioLif Hair Gro Therapy? 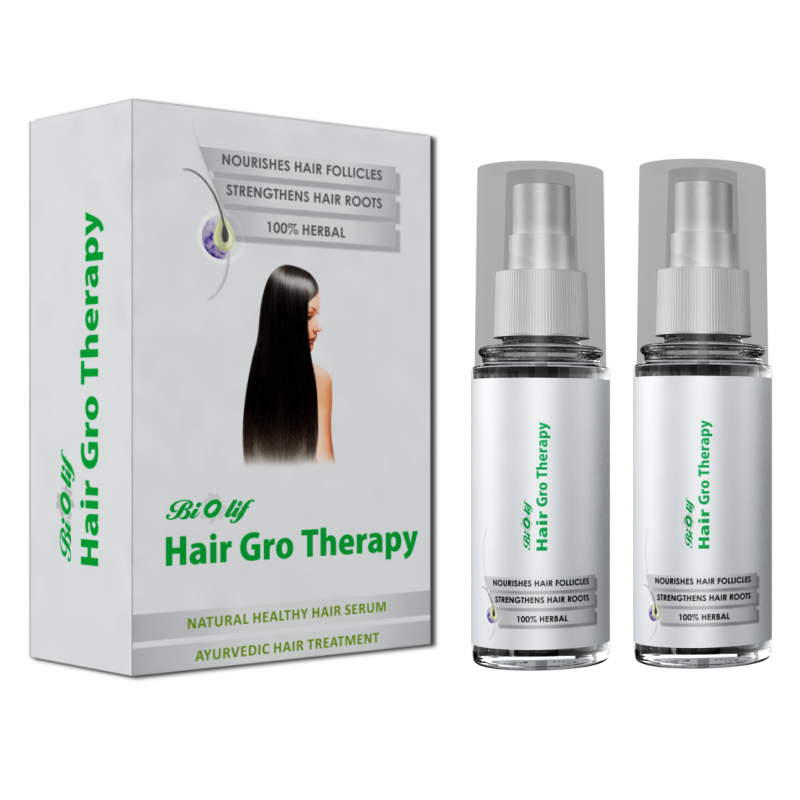 Just before you are about to sleep in the night, take out 8-10 ml of Hair Gro Therapy serum. Gently apply the serum to the scalp using your fingers. Circularly spread the serum over scalp and massage it thoroughly for 10 minutes. In the morning wash your hair and scalp with any Ayurvedic shampoo. Note: Recommended to use on alternate days for best result. What does one box of BioLif Hair Gro Therapy contain? One box contains two 100 ml bottle of BioLif Hair Gro Therapy serum. Rosemary Oil: Decreases DHT (dihydrotestosterone) level in the body to improve hair growth and prostate health. Increases hair growth rate. Smoothes hair to resist traction. Lavender Oil: It has an antiseptic property good for removing dandruff from hair. It also increases circulation in and around hair follicles which also affects hair growth. Grape Seed Oil: Rich source of antioxidants as well as vitamin A, vitamin C, and vitamin E. Also reduces hair loss and helps in regrowth of hair. Olive Oil: Restricts the production of DHT hormones in the scalp, and consequently hair loss. Perfect natural oil for regrowth of the hair. Wheat Germ Oil: Moisturizes the hair to reduce breakage and splitting.Highly effective on dry hair. Almond Oil: Ensures healthy and stronger hair also treats dandruff and hair damage. Makes hair shiny. Apricot Oil: Softens the hair and moisturizes them to avoid breakage. It is highly effective for hair regrowth as well. If the weather is colder than usual, please wash the head after one hour of applying the serum as the cooling herbs of serum may impact adversely. Never try to heat the serum. 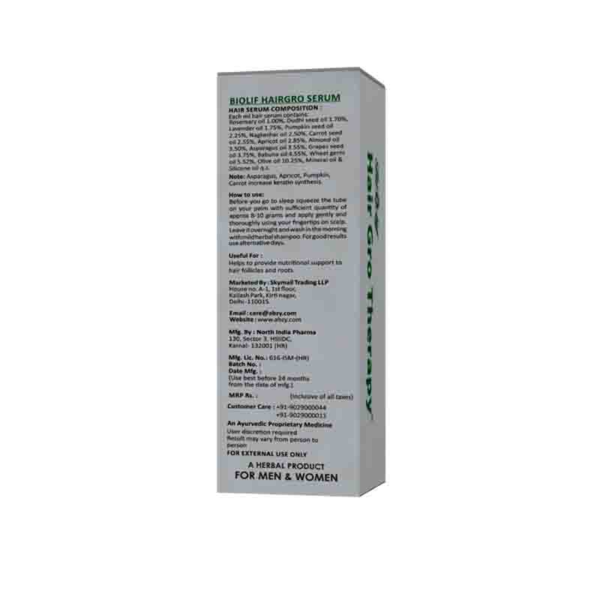 If you are suffering from any disease/ illness, please refer to a medical consultant before using the product. My son was using 10 day hair oil but it showed no effect. After using Hair Gro for 2 months can see good changes in hair growth. I am using hair gro serum for 3 weeks. My hair fall has completely stopped. This serum works. That’s all I’ve to say. Follow religiously and you would be happy. Thank You Hair Gro Therapy for resolving my problem. 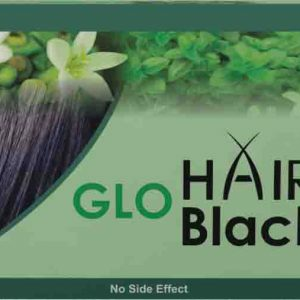 I can tell that this is the best product against hair fall. I used this product multiple times in Delhi. I always recommend this product against all available product in market. I used to have excessive hair fall. Hair used to be in the towel, comb. 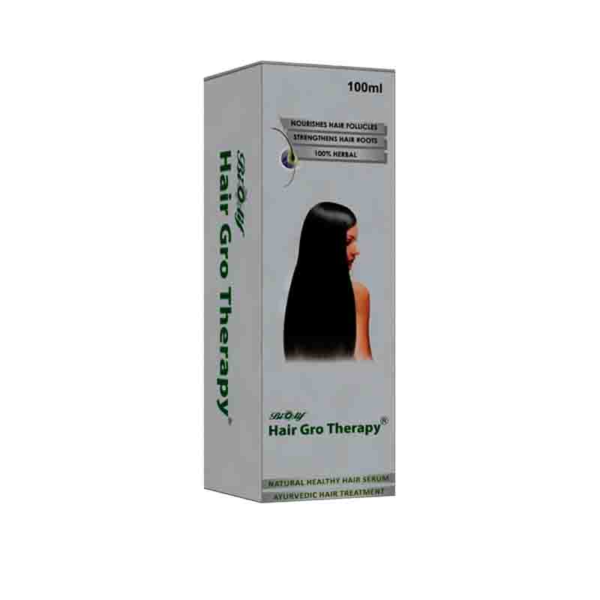 In Sep last year I ordered Hair Gro Therapy, I used it for three months and my hair fall is completely resolved. In fact, my forehead which had no hair,started to see regrowth and my hair overall has become thick. 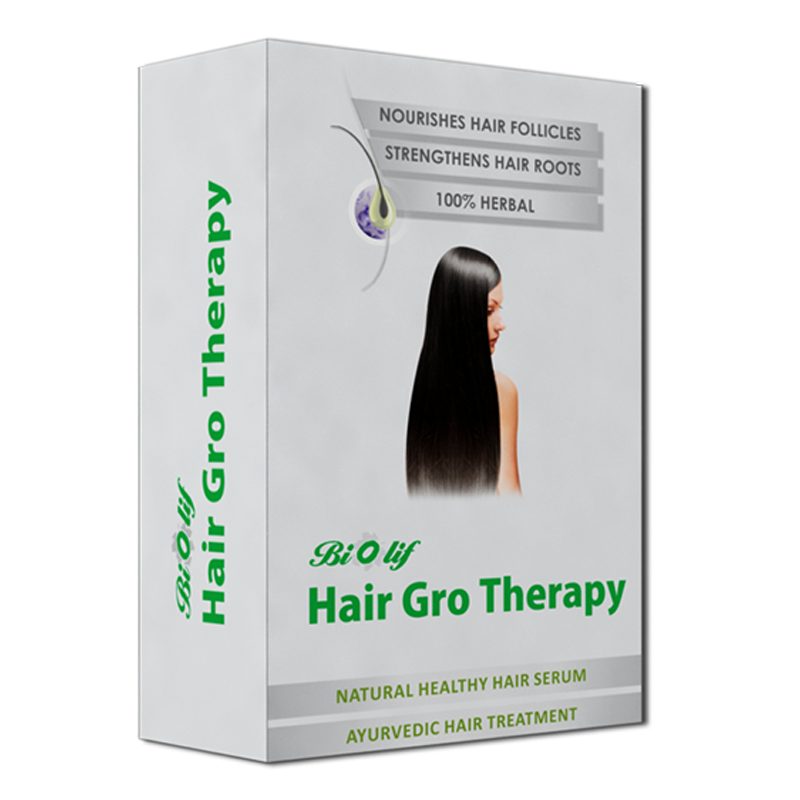 I have placed another ordered for 3 months because I really love Hair Gro Therapy and it has worked wonders for me.